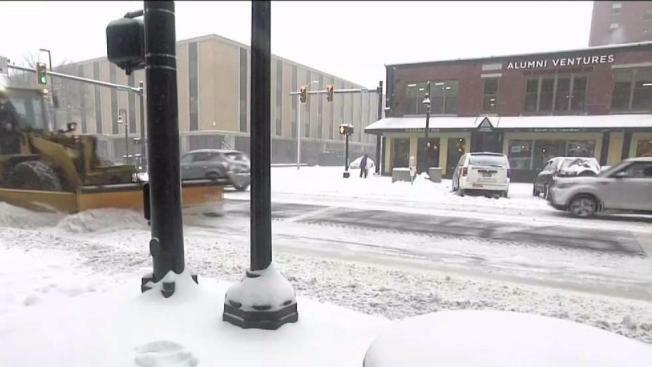 Snow, rain, sleet and ice abounded in New England Wednesday. 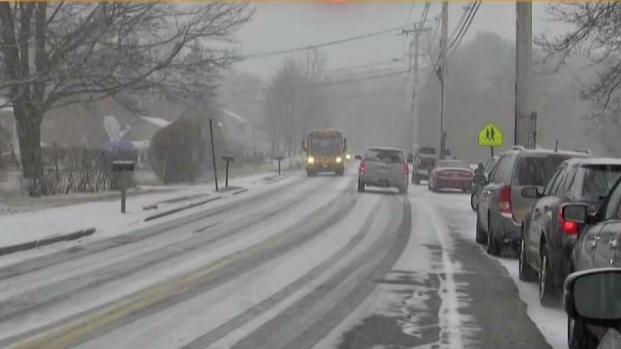 A winter storm made its way across New England Wednesday, dropping several inches of snow before turning to a slushy mess. The snow began falling Wednesday morning and was expected to end in the evening. A winter storm warning was issued for most of the day in Massachusetts and points north. The snow-covered roads led to numerous crashes across the region. 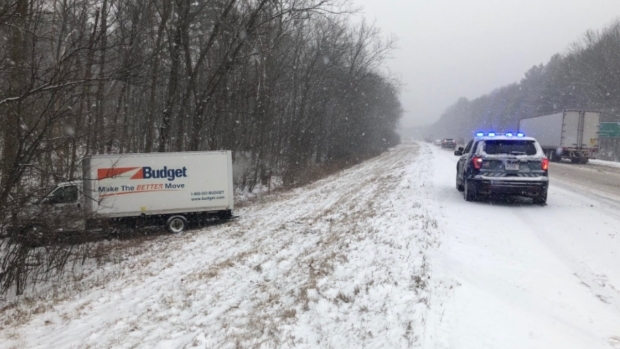 At least eight cars were involved in a pileup on Route 101 in Epping, New Hampshire, and accidents were also reported in other parts of New Hampshire and Massachusetts. "Oh my gosh, I was zig zagging all over the place," said Beatrice Monestine of Leominster, Massachusetts. Some schools let out early and others did not open at all Wednesday with varying amounts of snowfall across New England. "Dangerous - I’ve seen a lot of car accidents," added Daniel Lyra of Fitchburg. As hundreds of schools closed, some kids were happy to have a snow day, even though the slushy mess was less than ideal for snowmen, snowball fights and just getting around. "It’s been powdery, then it turned heavy then powdery again," 9-year-old Sophia St. Cyr said. Her 6-year-old brother, Connor St. Cyr, added, "I think that it’s really a little bit bad for the roads." "They made a good decision," said Gina Aguayo, a parent in Billerica. "I think getting them out of school early was a good idea for everybody involved. It kept the kids safe." The school district made the decision to get kids home and get everyone off the roads while still getting some instruction time in. A shortened day, rather than a cancellation, means staff and students won't need to make up the time down the road. 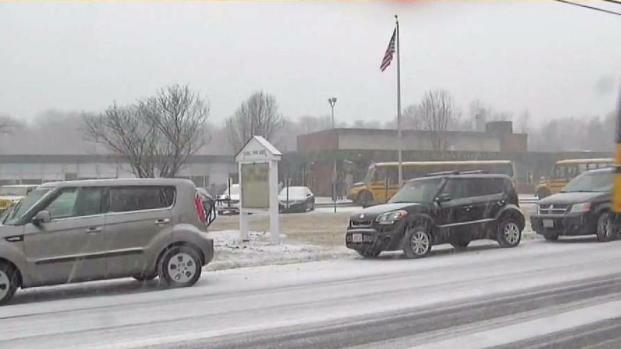 Students are being released early with significant snowfall in much of the region. "It gives the kids an opportunity to get some work done," said Jessica Fennelly, another Billerica parent. "Fills some hours so we won't have a day to make up at the end of the year." Truck drivers all over New England spent the day trying to keep up with the quickly falling snow, well aware it’s going to be a long night ahead. "Sloppy and wet and then it’s going to turn to ice," plow truck operator Dominic Traini said. That’s why many people tried to run errands earlier in the day to avoid the uncertain conditions during the evening commute. "When you see white stuff on the ground people perhaps drive more cautiously, but the ice is harder to tell," Desiree Demski-Hamelin of Fitchburg said. Others were unfazed by this wintry weather. "It’s snow. We’re in New England. You expect it, right?” said Alan Cormier of Fitchburg. In New Hampshire, the flakes started falling late in the morning and only got worse in the afternoon and early evening. "It came in," said Ben Hinkle. "I looked outside, a little dusting, and 20 minutes later the road was gone." Once the snow picked up speed, the accumulation was fast, making visibility challenging at times. However, some people were forced to be in the thick of the snow. "We had early release for school," Diane Baillargeon said. "They didn't want us to stay too late (at work) and risk it," Tracy Usciniski said. Manchester Deputy Public Works Director Timothy Clougherty said this is type of weather his department prepares for. "We have a heated garage, so we fill up our trucks with salt and then we will also brine the roads, pretreat them with salt," he said. The city's public sand dispensary saw steady traffic, with people filling up their buckets. "I gotta concrete driveway and the sand works good, plus it won't eat up the driveway much," said resident Ricky Black. In the late afternoon, the snow stopped and the freezing rain began. Clougherty urged people to be cautious. "If they need to be out, obviously take caution, drive slow, give yourself more time to reach your destination, but if you don't need to be out on the roads, stay off the roads."